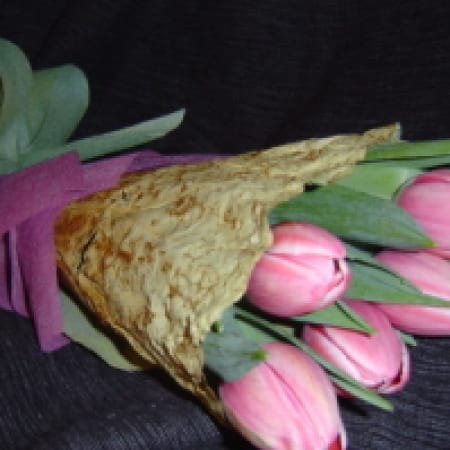 Amaranthine`s Tulip Bouquet, a classic bouquet for any occasion. Bright tulips combined with foliage in a unique lotus leaf wrap. A wonderful way to say Merry Christmas, Thank You, Thinking Of You, Happy Birthday or I Love You. Beautifully gift wrapped and delivered. Created by Amaranthine Flowers By Design, New Lambton, Newcastle. Same day delivery available to all areas of Newcastle, Maitland and Lake Macquarie, including John Hunter Hospital, Newcastle Private Hospital, Lake Macquarie Private Hospital, Maitland Hospital and Mater Hospital.